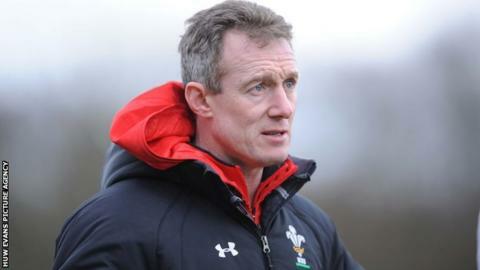 Interim coach Rob Howley has described Wales' trip to face Italy in Rome as "one of the toughest places" in Europe. Wales face Italy in the Six Nations at the Stadio Olimpico in Rome on Saturday. Howley has selected the same side which recorded a 16-6 victory over France in Paris. "It is one of the toughest places to go in Europe," said Howley, who has drafted lock Alun-Wyn Jones and flanker Sam Warburton onto the bench. Howley has identified the need for Welsh discipline against the Italians but is under no illusions the difficulties facing last season's Grand Slam winners. "I think they have got a great set-piece, and it is important we stop them at source and impact the game on what we want to bring to the 80 minutes," said Howley. "We've always had a tough outing against Italy, home or away. They are very difficult to break down, they are very well organised, they've got some world-class players and they are coached very well. "It is a good challenge for us. On the back of winning in France, we realise that one win isn't good enough. It is about some momentum, and we need to go out there and beat Italy. "The key for the weekend is discipline. It is the one thing we will talk about between now and then." Ryan Jones, who replaced Warburton as skipper for the victory at the Stade de France, will captain Wales for a record 31st time. Warburton, who missed the France game with a shoulder injury, will be joined by lock Jones on the Wales bench in Rome. The Ospreys lock, who suffered a shoulder injury during the Millennium Stadium defeat against Argentina three months ago, has made a couple of comeback appearances for his region. Cardiff Blues lock Lou Reed and Scarlets flanker Aaron Shingler drop out of the match-day 23 on duty against France, with Howley's bench contingent boasting a total of 264 caps.